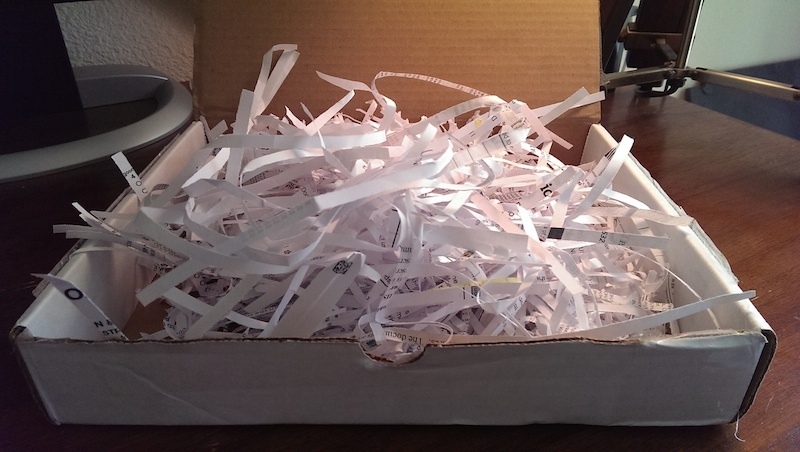 A few years ago I blogged about the importance of using a good paper shredder. A crappy shredder is just (bad) security through obscurity, and easily leaks all kinds of info. So I was delighted and horrified to find this package show up in the mail, using shreds as packing protection for the item I had ordered. Using a cheap, damaged, or simply overloaded shredder that doesn’t even fully cut the paper. I got an inch-wide swath of two pages for free. Shredding in the direction of the printed text. 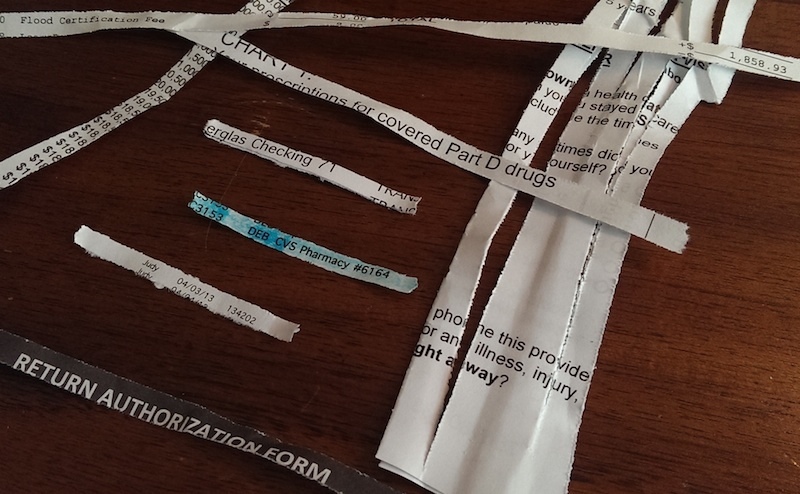 Sending the poorly-shredded output to a random person who bought something from your business. And of course it would have been better security to use a microcut shredder. Now, to be fair, even this poor shredding has technically done its job. Other than a few alluring snippets, it’s not worth my time to assemble the rest to see the full details of these banking, business, and health care records. But then I’m a nice guy who isn’t interested in committing fraud or identity theft, which is an unreasonable risk to assume of every customer. In my last blog post, I wrote about how I helped fund the launch of a satellite via KickStarter, and that after launch I would have more to say about receiving radio signals from it. This is that update. So back to to satellite I funded: KickSat. The “carrier” was successfully deployed, and the first telemetry packets have been received and decoded. 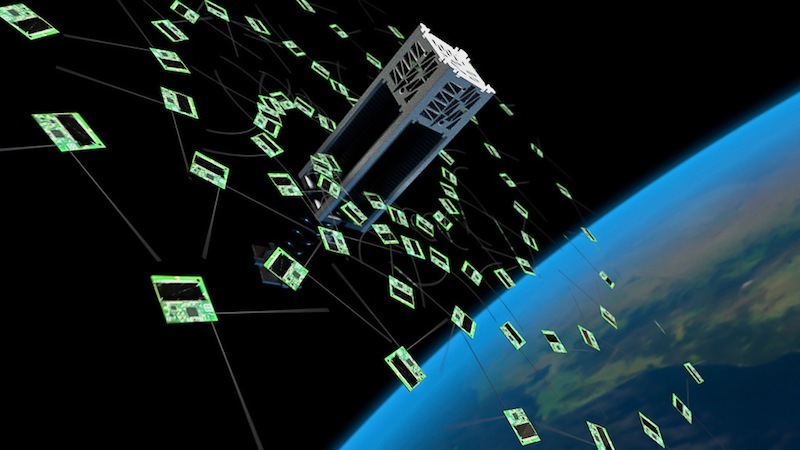 In a couple of weeks (May 4th) it will deploy its 104 “Sprite” nanosatellites, which will each start broadcasting their own unique signals. Things are off to a great start! The slightly bad news is that I haven’t been completely successful in capturing Kicksat broadcasts with my own ground equipment. Yet. The biggest factor is that the signals are inherently just not very strong, due to power limitations. 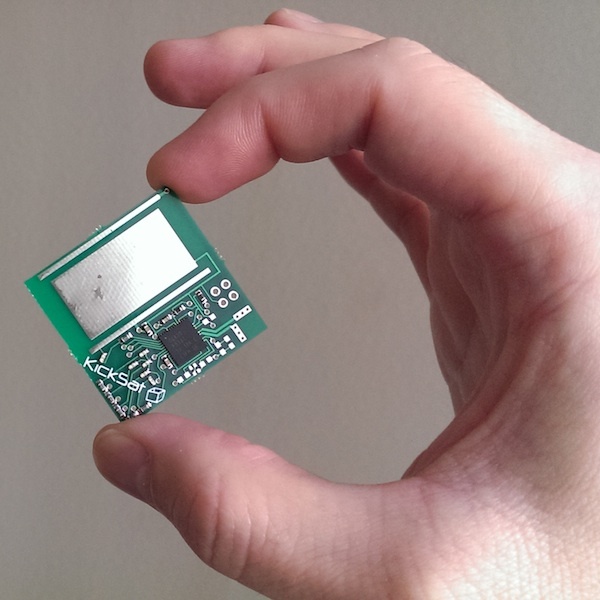 The KickSat carrier is a 3U cubesat, with limited area for solar-cells. It periodically broadcasts a brief telemetry packet with a 1-watt radio, which is what I’m trying to capture. 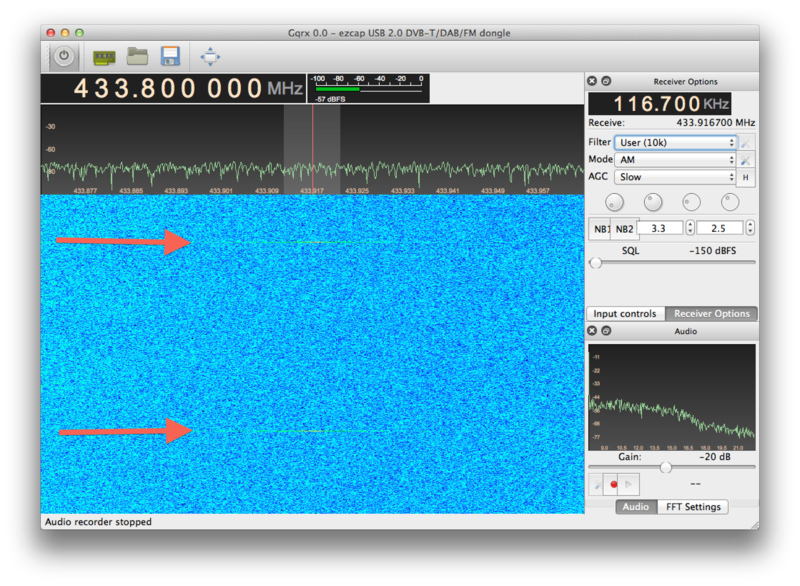 Such faint signals need some modestly specialized (but still off-the-shelf) equipment to enable reception. I’ve got a yagi antenna and low-noise amplifier, as recommended on the KickSat wiki. Successfully making use of it is a little tricky, though. 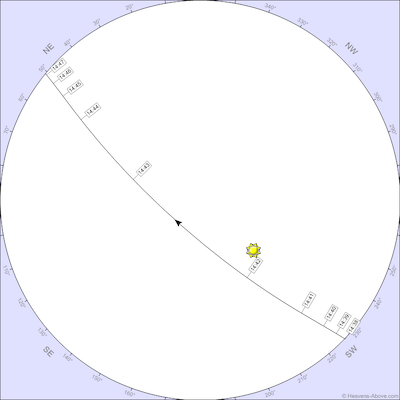 You need to use orbit tracking tools (e.g. 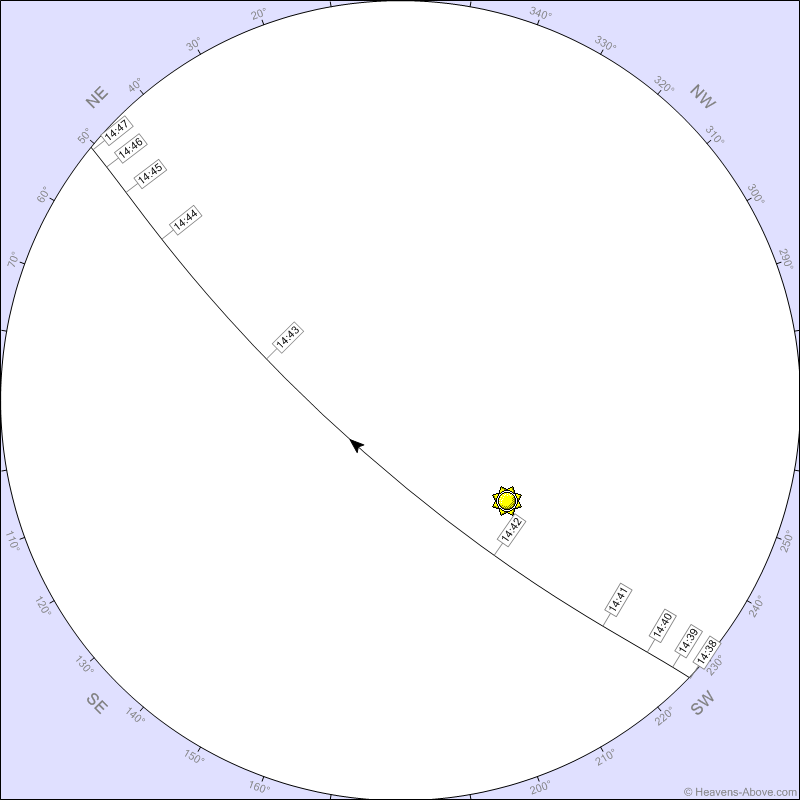 gpredict or via Heavens Above) to know when a satellite pass will occur, and where in the local sky its path will be. Yagis are directional, and thus need to be pointed (at least roughly) to the right place. Not every pass is directly overhead, and if it’s too low on the horizon it may be too hard to receive (due to strength or interference). Additionally, KickSat only broadcasts a short packet once every 30 or 250 seconds (depending on what mode it’s in), and during a pass it’s only above the horizon for a few minutes. That makes for a rather ephemeral indication that it’s even there. Blink and it’s gone! My location has about 4 pass opportunities a day, but not all are useful. 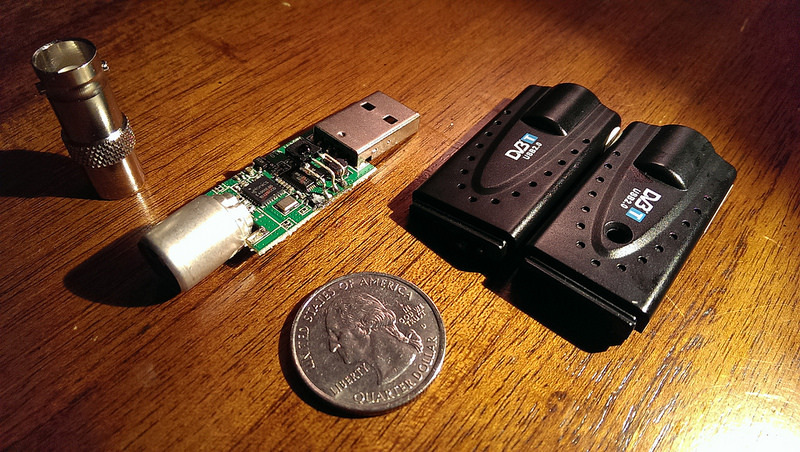 Oh, and did I mention I’m doing this all with a cheap $20 RTL2832U software defined radio?! Heck, the coax cables connecting my dongle to the antenna cost more than the radio itself! I decided to start off by first trying to catch signals from some other satellites. 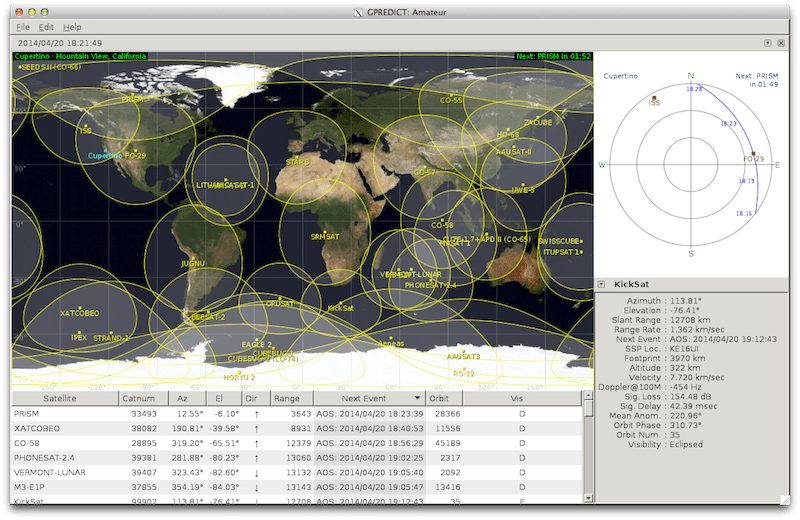 I went through AMSAT’s status page and DK3WN’s fantastic satellite blog and gathered a list of a couple dozen satellites known to be active on the same 70cm (~435Mhz) band KickSat is using. My first success was HO-68 (aka Hope Oscar 68 aka XW-1). 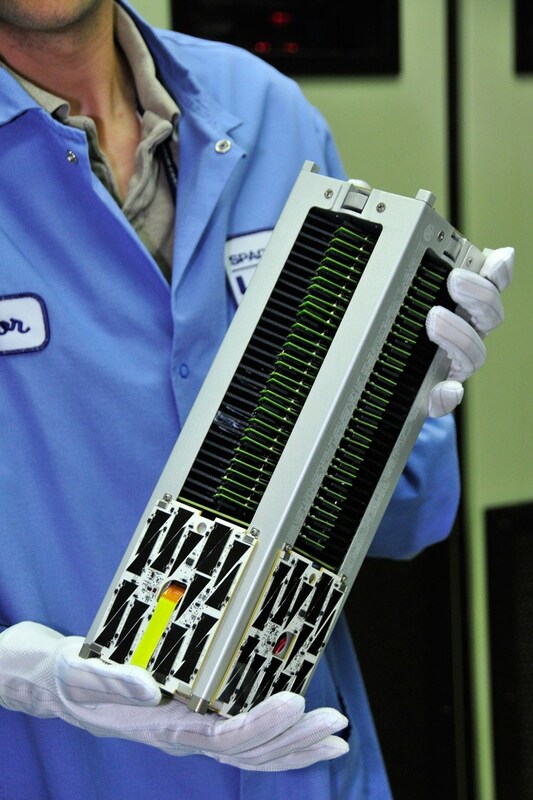 This is a Chinese satellite launched in 2009, broadcasting a fairly constant 200mW telemetry “beacon” in morse code. Picking out the dotted line in the GQRX waterfall display was pretty easy, even though it’s not exactly on the expected 435.790Mhz frequency due to inaccuracies in my radio and doppler shift(!). This is what it sounds like: WAV | OGG. Why is the tone shifting? The gradual lowering is doppler shift. 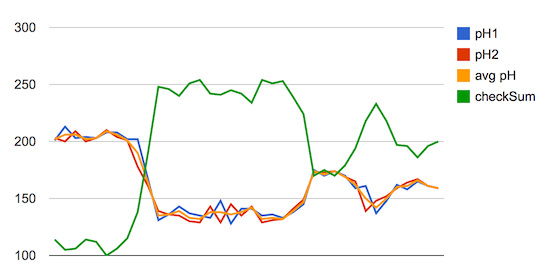 The abrupt jumps upward are just from me adjusting the radio tuning to keep it audible. My morse code skills are terrible, but I replayed it enough times to convince myself that it starts out with the expected “BJ1SA XW XW” (the radio sign and initials of its name), per the page describing the signal format. For the lazy, that’s – . . . / . – – – / . – – – – / . . . / . – / – . . – / . – – / – . . – / . – – in morse code. Here’s a screengrab of gpredict, showing the predicted path low in the sky, from the southeast to north. It’s got a stronger 1-watt beacon, which wasn’t too hard to spot. 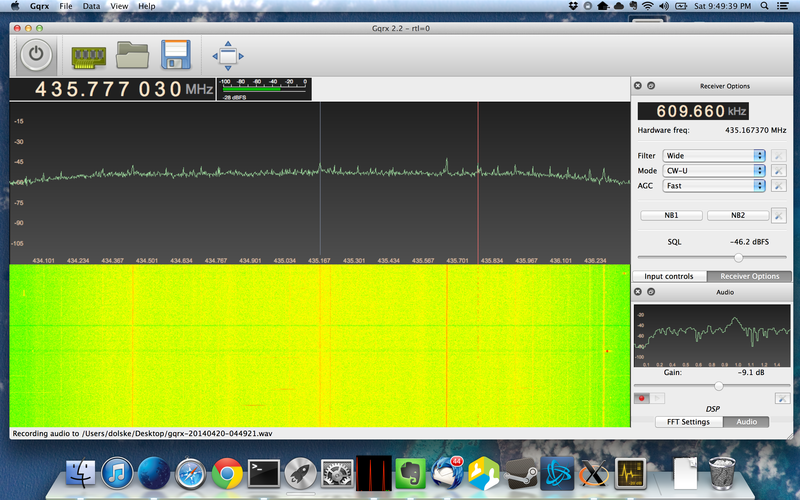 Here I’ve switched from GQRX on OS X to SDRSharp on Windows. 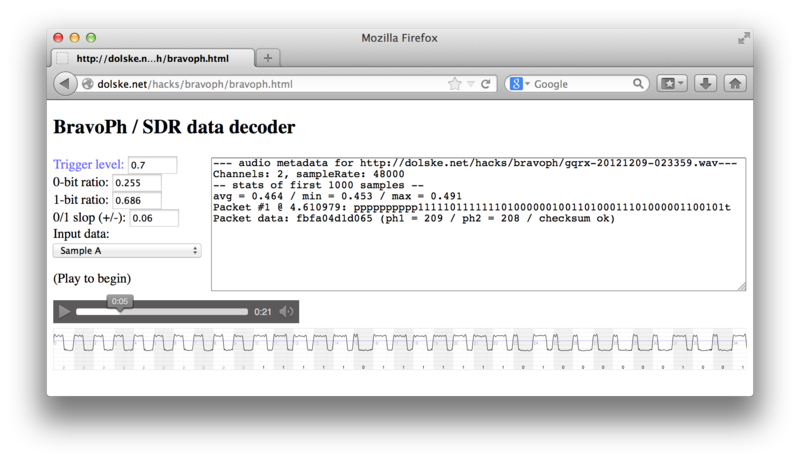 It has more features, plugins, and makes it easy to zoom in on a signal. The signal with doppler-shift is readily apparent as a diagonal line. And lastly… *drumroll*… After a number of unsuccessful attempts to receive KickSat’s signal, I finally caught it today! There was a nearly-overhead pass in the afternoon, so the as-received signal strength was optimal. I pointed my antenna upwards, tilted it to my clear northeast view, tuned SDRSharp to the 437.505 MHz KickSat frequency, and waited. This is one of the usecases where software radio is really useful… While waiting, I was was recording the entire raw ~2Mhz slice of bandwidth around that frequency. That’s 4.5GB for the 7 minutes I was recording. I actually missed the transmission the first time, as it’s indicated about 23kHz lower than expected (again, due to hardware inaccuracies and doppler shift). But no big deal, I just replayed the recorded data and fine tuned things to the right spot. Here’s what it sounds like: WAV | OGG. Unlike the steady stream of analog dit-dahs from HO-68 and FO-29, this is just 2 seconds of digital “noise”, like you would hear from a dialup modem. In fact, it’s exactly what you’d hear from an old modem. KickSat is using the 1200bps AFSK-modulated format, which is apparently still widely used in amateur packet radio. There are decoders available to extract the digital data (GQRX has one built in, and SDRSharp output can be piped to the qtmm AFSK1200 decoder). If you’ve got SDRSharp, here’s the raw IQ data for the packet (ZIP, 60.3MB). I cropped the data to just the relevant portion. Alas, I can’t seem to get the decoder to recognize the packet. 😦 I’m not quite sure what the problem is yet… I’ve successfully decoded other AFSK data with this setup, so I suspect my signal was just too weak/noisy. Could be poor antenna pointing, but this was an easy pass. Some folks have had success with improving SNR with shielding, but I haven’t been able to replicate their results. There are a number of knobs and dials in SDRSharp to adjust manual/automatic gain control, so I might need to tweak that. (Unfortunately difficult, as there are only a few brief chances a day to catch KickSat.) 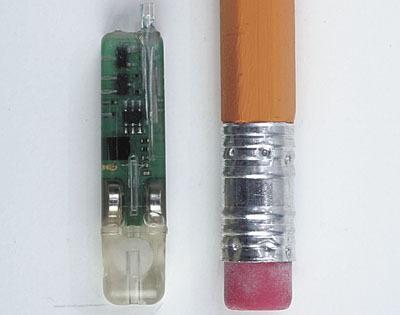 It’s also possible that this is just slightly beyond the capabilities of a $20 RTL2832U dongle. Other options exist. I’d love to get a HackRF SDR board, but they’re not available yet. The FUNcube Dongle Pro+ can be had for about $200, but from comparisons I’m not sure exactly how much better it is in this band, or if it’s worth it. I’d love to hear opinions from hams who know this stuff better, or have tried both! Amusing aside: while poking around in the 70cm band for interesting things, I stumbled across Santa Clara County’s ARES/RACES packet radio BBS. (Apparently, Ted, that is indeed still a thing!) In fact, FO-29 is actually an orbiting BBS! 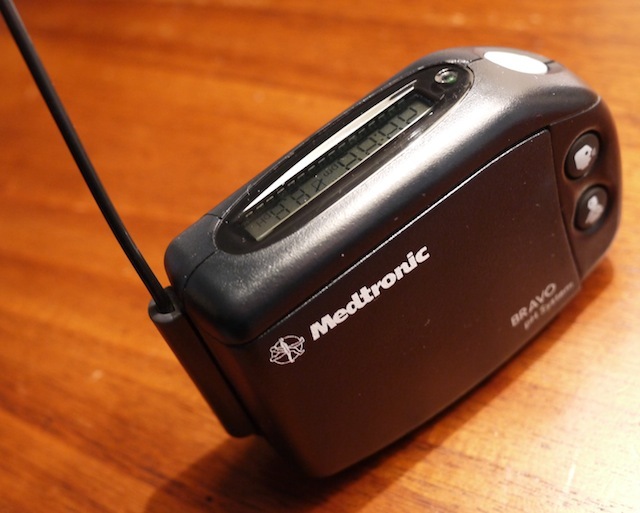 It’s quaintly amusing in the Internet Age, but when it launched in 1990 it must have been amazing. I had just upgraded to a 2400bps modem and discovered FidoNet and UUCP to reach beyond the local area code BBS systems. That’s it for now. Over the next few weeks I’ll be refining my equipment and skills, and hope to capture some solid transmissions by the time my Sprite deploys. That will be even tougher to catch, but it’s a fun challenge! It’s a device made of a programmable LED strip attached to a jump rope, which can be used with high exposure photography for Light Painting. 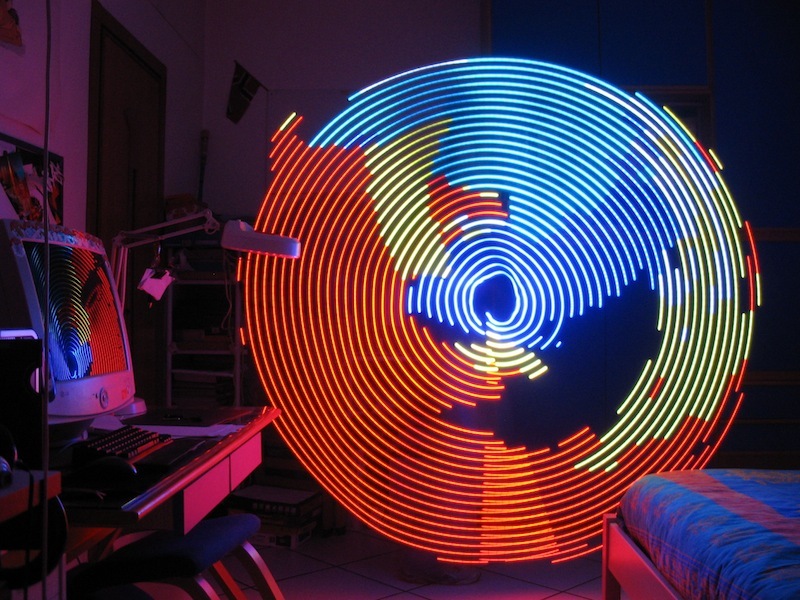 The principle behind it is the same as those cool POV (Persistence of vision) displays.